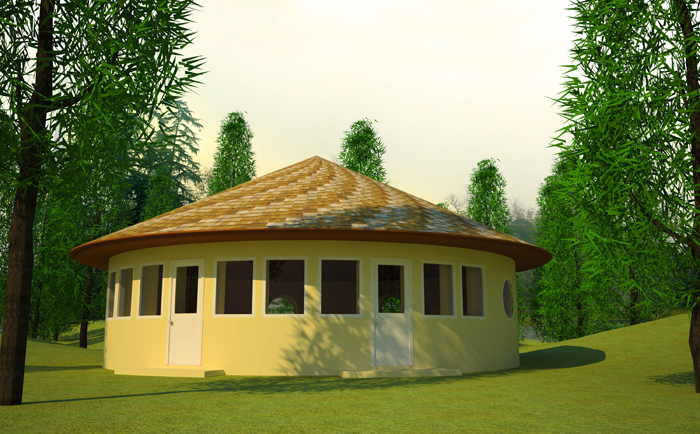 Description: 10 meters (33’) diameter is the maximum size of a round earthbag structure before needing buttressing. This spacious design features a large kitchen and south-facing window wall for excellent solar gain. AutoCAD generated drawings of this plan are now available at no extra cost through Dream Green Homes. this would have a lot of potential for us. big question: the roof. what is it to be made of and what shape? a yurt roof might be possible for places with less snow; a cone? then there could be a lot of space up there to expand that I think you would have mentioned, so I am guessing it is a low pitch (hoping living) roof, but can it take the weight? and that touches on the other question: are those bearing walls? one small suggestion: if you put the sink on the other side of the kitchen it would cut down on the plumbing. This plan has a conical roof that could be built in various ways. See my article How to Build an Eco-friendly Earthbag Roundhouse. In summary, you could build a reciprocal roof out of poles and have a living roof. Reciprocal roofs are very strong. You could also use rafters supported by steel cable and then use metal roofing. Also, there are other options such as adding a center pole. This may be the best option for regions with heavy snow loads. And yes, the walls are load bearing. Sink: All my other plans have the sink and stove locations switched. This plan is different because the interior wall makes it impossible to add a window in front of the sink. Most people don’t want to face a wall while doing dishes. Of course, you could put the sink over by the refrig, but whoever is washing dishes would have their back turned towards everyone else. I have no idea why you think this is 33′ tall. This is a one story home with 8′ high walls. Ooh, maybe you are thinking it’s 33′ high? No, that’s the inside diameter. Great plan! I have been working on my own design yet I cant find a way to improve on what you have designed. I live in the Azores Portugal. I want to build this structure and buy the plans. I am interested in buiding a structure with your 2 story plan with two of your 10 meter round houses connected. The first 10 meter round would be connected to the 2 story round at 4 oclock and the other at 8 oclock respectivley. If we use the 10 meter round houses as a butresses to the 2 story house could we go a little larger than 10 meters on the two story center section? I would like the option of renting the entire home or renting out each 10 meter round individually. I am concerned about earthquakes. Local building code requires a cement interconnected footing and a beam all around the upper walls where the roof connects to the walls. This concrete beam is called a “earthquake belt” The beam would need to be poured on top of the earthbag walls and them connected to the footings. Do you have recommendations for sesmic adjustments to the plans called 10 meter round and 2 story round? Can I call you to discuss my project? Can you send any pics of theses plans built? I love your idea of connecting two 10-meter houses with the 2-story roundhouse. This is definitely a possibility. And using them as rentals is certainly do-able. I wouldn’t go larger than 10-meter diameter. The 2-story would buttress it on one side, but the rest of the house would be unbuttressed (the way you describe). Special consideration will be needed in earthquake zones. The reinforced concrete bond beam is critical. There is some disagreement over concrete footings concerning whether or not they are necessary. Some say earthbag foundations are more flexible. Since there’s no proven track record on this, I would go with a reinforced concrete foundation as well. Also, I would add at least two buttresses on each 10-meter roundhouse to reinforce the south-facing window walls. That’s the weakest area. I’m very interested in these plans and will be buying them for myself in the future but I’m also planning on building a house for my mother and she needs two bedrooms. Would it be possible to move the kitchen area into the southeast of the house and turn the existing kitchen area into a second but smaller (to allow access to the bathroom) bedroom? I think it would be nice to have the kitchen work area right infront of the windows anyway. It doesn’t seem like it would be too cramped to put a small dinning area inside the kitchen and use the existing dinning area as a living room. Thanks a lot. Paul, that’s definitely a possibility. What you describe is a good way to add a second bedroom. The living room will be tight, but for those that need a second bedroom this is a viable option. One drawback is people will have to walk through the bedroom to get to the bathroom. Just a thought on Antonio’s idea of switching the stove and sink – if you are thinking of having a range hood to reduce moisture it would really brake up the open plan feel if it was over the breakfast bar. Also, the position of the cooker is central enough to be the heat souce too – how about using a woodfired range to cook off and killing two birds with one stone? Carol, I like wood cookstoves and a small one would fit there. This would enable you to omit the wood stove in the living room, as you’ve pointed out. And I agree with you, the sink is probably best left where it is. Coming soon: 2-bedroom 10 meter roundhouse due to popular demand and the practicality of having an additional bedroom. Have you read http://www.EarthbagBuilding.com and our Earthbag Building Blog at http://earthbagbuilding.wordpress.com? Kelly Hart and I try to provide everything you need to build your own low cost home using earthbags. This includes profiles of all the best projects, a library of articles, tons of photos, lots of videos, etc. all for free. For example, here’s an article about Insulated Earthbag Articles from our Articles page at EarthbagBuilding.com: http://www.earthbagbuilding.com/articles/insulated.htm. It explains several ways of using earthbags in cold climates. I’ve recently been looking through all the great info online about earthbag homes and I definitely what to build one. I know the smaller homes are more efficient and cheaper, but I’m trying to figure out a way to do a large roundhouse (vertical wall) to accommodate a larger family. My question is… what would it take to build a 60′ diameter roundhouse. The plan I came up with had buttresses about every 10 feet. Also, what would you recommend for the roof? Large earthbag roundhouses are possible using buttresses. I can quote you a custom design if you email me at strawhouses [@] yahoo.com. Factory made trusses are the easiest, safest approach for the roof. Your local truss manufacturer will give you a free quote. I live in hawaii where crushed volcanic rock (cinder) is readily available and cheap. Will cinder work to fill the earthbags? It doesn’t compact too well. I recommend using clean, screened or ‘graded’ volcanic aggregate of about 1/2″. A local gravel pit should have something near this size. This will create a real nice wall. However, it will be less stable than tamped earth during construction, so you will need to add some temporary bracing while you are building. But not to worry, the bond beam will tie everything together and create a very strong structure. It`s a great design, we will use it also soon, hopefully in Portugal, depending if the local building regulations will allow us to do it..
That`s why we would like to get in touch with some like-minded people from Portugal, who could give us useful tips and ideas of how these things are working in Portugal. Hello Owen, I was looking at your drawings of the round house designs and I think that the diameter of the houses could be safely increased without buttresses. Wrap the exterior walls in polystyrene sheeting and overlay this with 4 to 6 layers of half inch chicken wire trowel in a mix of one part cement to three parts sand and enough water to make it workable. In stead of stucco, think ferrocement tension ring; think Dirt Yurt. A reinforced concrete bond beam is also a good idea. That’s a great idea, Glenn. Thanks for sharing. My design already has a reinforced concrete bond beam. But your system would create a more rigid shell, enabling larger structures to be built. The downside, however, is greater use of energy intensive materials. Okay, How about this? Replace the polystyrene sheets with papercrete, and replace the portland cement with a mixture of hydrated lime and some kind of pozzolanic ash. Julian Keable gives some recipes in his book Rammed Earth Structures: A Code Of Practice. Also if you make the exterior wall about ten feet high, you can run a top band of ferrocement about two feet wide around the top of the wall above the door and window openings. That should be plenty strong. The chicken wire is non negotiable. The papercrete wouldn’t add much if anything and can mold in humid climates. The cement mixture you suggest is fine. Tall walls are more unstable than low walls, so I would limit the height to about 8′-9′. The ferrocement banding probably wouldn’t help much if you already have a reinforced concrete bond beam with vertical rebar pins down into the bags (= standard recommendation for most all earthbag structures). And yes, plaster mesh is a given. So I still think anything beyond a 10 meter roundhouse will require buttressing or other reinforcement such as posts. Dr. Geiger, I am a single mom of 2 that is finishing my education in NY and moving back to Ohio, Marion area in two years. I have been studying for the last 6 months eco-friendly, cost effective, housing when my kids and i return to ohio. I have decided on a earthbag home. I love the design of the 10 meter earthbag round house. But i am looking for something that has a little more space. I understand that i will need buttreses if i go bigger, my son will need a sensory room, due to his Aspergers. I will need a study and alter room, and my daughter will need a room. So that would be 4 bedroom type areas. I am also wanting to build a hobbit type structure as a second structure. Do you have any plans on line that i could look at, or what is the price of you drawing plans for me to take to Ohio. You have several options. You could build 1-1/2-story and put two bedrooms and room to spare upstairs. I have a plan like this in progress with the front half open to the ceiling and the bedrooms in the back half. Or you could build two story or one story over a basement and have even more space. You could also build two or more structures and join them. Contact me directly at strawhouses [at] yahoo.com for pricing. Reading all the questions I see Ken from the Azores portugal is looking to build an earthbag house. I too live on the Azores and would love to get intouch with him. Please could you forward my email address to him or help me to contact him. He bought the plans and was going to build a resort next to the ocean, but then suddenly quit writing. I tried to track him down without success. Please let me know what happened if you find out anything. He owns a gravel pit.